The theme of this year’s World kidney day (9th March 2017) is ‘kidney disease and obesity’. We are all well aware that obesity is a growing worldwide epidemic, but many people may not realise that it is also one of the strongest risk factors for the development of new onset Chronic Kidney Disease (CKD). REMEMBER this is only a guide. 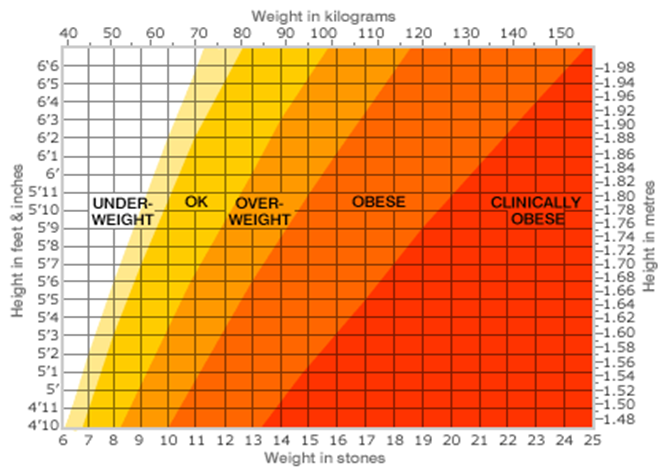 Your dietitian/ doctor can advise on what YOUR individual weight target should be. We are all very different with different dietary needs. The renal dietary guidelines vary depending on your kidney function and the type of treatment you are receiving. If you are trying to lose weight, or if you are trying to maintain an already healthy weight, here are a few tips to help you along the way. Tip 1: Have regular meals everyday starting with breakfast; avoid missing meals or eating late at night. If you are receiving dialysis, try to ensure you still eat regularly on the dialysis days. Tip 2: Base your meal on starchy carbohydrate, choosing high fibre varieties e.g. wholemeal or wholegrain (speak to the dietitian if unsure of suitable choices). These will help you feel full up for longer; e.g. bread, potatoes, rice, pasta, cereals and noodles. Tip 3: Eat fruit and vegetables within your dietary allowance, these are a healthy snack. Tip 4: Avoid sugary drinks and sugar (added in drinks or on cereal). Use the low calorie varieties e.g. diet, low cal, sugar free. Artificial sweeteners can be used if required. Tip 5: Choose low fat products where possible e.g. cheese, yoghurts (within allowances), low fat spread, low fat milk, salad dressings. Tip 6: Fats and oils are very concentrated sources of calories, try not to fry food – grill, boil, or oven bake instead. Tip 7: Control your portions/ fluid by using a small plate, cup, glass. Tip 8: Set a realistic target, average recommended weight loss is ½ -1kg (1-2lbs) per week – weigh yourself only once each week at the same time, as your weight can fluctuate daily. Tip 9: Avoid salt and salty foods to help protect the kidneys. Tip 10: Sit down to eat at a table, eat slowly, chew well and enjoy your food. Eating in front of the television is a distraction and will leave you feeling less satisfied. Tip 11: It is your daily routine that is important, special occasions can still be enjoyed. There may be times when you eat too much or make the wrong food choices, don’t let this stop you achieving your goal. Tip 12: Never go shopping on an empty stomach, shop from a list. Finally: Think long term, not quick fix. If you are following dietary advice for your kidney health be aware of this when trying to make suitable choices for weight loss or to when trying maintain a healthy weight. With thanks to Briege O’ Kane, Senior Dietitian Renal, Letterkenny University Hospital, Letterkenny, Co. Donegal. On behalf of the Renal Interest Group of the Irish Nutrition and Dietetics Institute.